After careful deliberation, you’ve come to the conclusion that you like it, and have decided the only appropriate course of action is to put a ring on it. Asking someone to spend the rest of their life with you might just be the biggest decision anybody will ever make. If you aren’t completely prepared for a lifetime of loving their quirks (even the annoying ones), playing nice with their family, and enlisting your services for permanent spider-killing duty, stop reading right now. If you’re cool with all that, however, and have been through the countless hours of contemplation, choosing and purchasing a ring, and wearing a path in the carpet pacing back and forth agonizing over your decision for several days or weeks, you just might be ready to pop that big question. Primer is here to help you devise a battle plan. Whether it’s a simple, intimate proposal or an extravaganza, the effort you put into the proposal itself can set the tone for the rest of your relationship. Don’t believe me? Check out the countless bridal web forums loaded with posts saying they love their ring and fiancée, but secretly wished he hadn’t proposed on the Jumbotron. Rule number one of planning a successful proposal: know that the answer will be a yes in advance. It may sound like a spontaneity killer, (it isn’t) but what’s worse: losing maybe 10 percent of the surprise factor, or losing your relationship and selling the ring at a pawn shop for half of what you paid for it? And is this really something you want to go into without a definitive pre-yes? You’re committing to spending the rest of your life with someone, not suggesting maybe you split a dessert at Applebee’s. To describe this decision as gigantic would be doing a gigantic disservice. But how to get that pre-yes? If you’re at this point in your relationship where you’re considering marriage, the subject has presumably come up at least once or twice. Does your partner want to get married at all? Do they want to get married to you? These aren’t question marks you want to leave unaddressed before you get down on one knee. One method of gauging whether your partner thinks you’re really “The One” is to scan the words they use when talking about your future together for clues. The person in the latter example is probably primed and waiting for you to ask. Ball’s in your court, buddy. If you’re going for a surprise proposal, remember that you don’t want to tip your hand too much, so having this conversation a few days or weeks before you plan on popping the question might give her a big flashing “he’s about to propose to you” sign. Your best bet is to try and have the topic come up organically and to subtly weave any questions you may have into the fabric of the conversation. If you’re smooth, you can get all the answers you need and they’ll never suspect a thing. Don't Believe The Divorce Rate Lies! Divorce rates peaked in the 1970's and 80's but have been dropping for 20 years – they are nowhere near 50%, and there are some who argue those figures came about from comparing apples to oranges. The number of estimated marriages starting in the 2000's that will never end in divorce. Of marriages beginning in the 1990's, 70% reached their 15th year. A big question people often wonder before proposing is whether asking the parents ahead of time still has a place in today's world. That’s a very personal decision that you need to make based on what you know about your spouse-to-be. Are they on the traditional side? Do they pride themselves on being super modern? Is your partner close with their parents? Are you close with their parents? While straight up “asking for your son/daughter’s hand in marriage” evokes images of horse-drawn carriages and top hats, a more modern take on the tradition is to simply tell the parents of your intentions to propose without actually asking their permission. This might not be so easy if her father is the overbearing type (especially if he’s huge), but stand your ground, because this is your chance to show him that you’re an assertive, mature man, which he’ll have to respect you for, approval or no. Advice columnist and author April Masini, better known as Ask April, says it might even help forge a relationship with your in-laws to be. “Asking her father for her hand in marriage before you ask her, may seem cheesy, but it also may endear you to her folks (priceless) and not doing so may disappoint,” she said in an interview. April also suggests if you do decide to ask pops for her hand, be sure you do it close enough to the big day to minimize the chance of word getting out. “Loose lips sink proposals,” she warned. Another genuine consideration is whether their parents can be trusted with the secret. If you know your future fiancée is more traditional and would like her parents to be told or asked ahead of time, take that into consideration, but you don't want her dad telling his golf buddies about it and the word spreading from there. So proceed with caution. Which brings me to another important point: Don’t go blabbing your plans to propose to your buddies at the bar after a few drinks. Once you’ve decided to propose, you will be excited and want to share the news. Don’t. People getting married is very gossip-worthy, especially within the couples’ circle of friends. When I asked Michele Velazquez, a professional proposal planner and owner of The Heart Bandits who it’s safe to reveal your plans to ahead of time, she didn’t mince words. “No one if you can help it,” she says. The proposal itself should be a reflection of your relationship, and should focus on the person whom you’re asking to spend their life with you. If you’re ready to get engaged, you’ve probably picked up a thing or two about their likes and dislikes over the years. Try to make it as sensory an experience as you can, all tailored specifically for them. If your fiancée-to-be’s idea of a good time is a quiet evening making dinner at home, they probably don’t want a lavish Broadway production for a proposal. Less, sometimes, really is more, and romance doesn't have to be expensive as long as you make it personal. The proposal should match your relationship above all. That said, if you’re stuck for your own ideas or have the funds to make it rain, by all means do it. Splashy proposals are in right now, and a whole industry of professional proposal planners has sprung up in recent years. Velazquez says for between $189-$249, her company will devise unique proposal concepts for clients. As for the proposal itself, the range of services they offer is vast, and the sky's the limit on price. 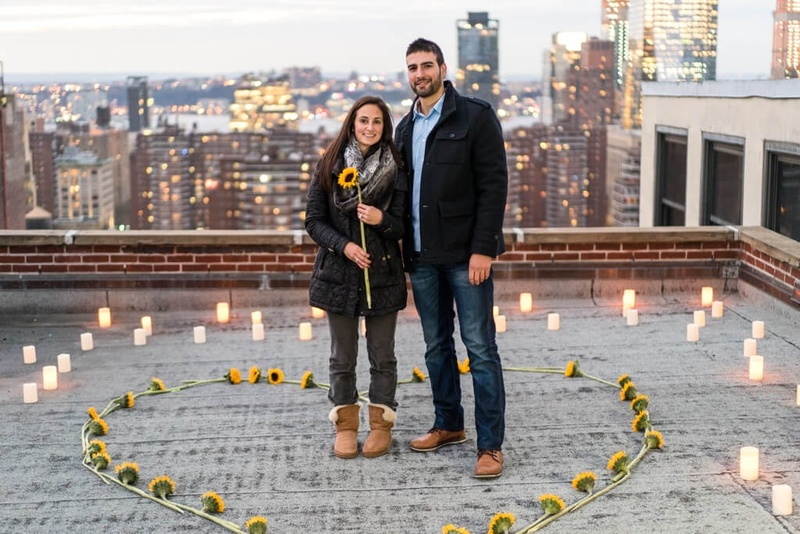 For $1,249, you can propose with a billboard in New York’s Times Square, a romantic picnic set up in a park in Paris to be “stumbled upon” by you and your sweetheart will run $650, and a flash mob proposal in Miami will set you back $1,847. Travel expenses not included, of course. Above all, Velazquez says, don’t go in unprepared. Hopefully now you’ve got some ideas that will get you on the right track to the big moment, but let’s talk for a moment about some other important things to consider. You’ve come too far to blow it now. For starters, destination proposals are a romantic (and pricey) way of kicking off the rest of your lives together. But it’s a classic high-risk, high-reward scenario. Yes, it’s probably everyone’s fantasy to be proposed to in the crystal blue Caribbean Sea as dolphins jump in synchronized rhythm around you both. You’d have to be a mad man not to want something like that. But that glee would turn to fury pretty quickly if your nervous, shaky hands dropped the ring in the water. And it happens. A lot. Another thing to consider when contemplating a proposal that requires getting on an airplane is the security line. No matter how well you hide the ring in your luggage, it would take nothing more than a well-meaning TSA agent seeing the ring on the x-ray screen and offering you congratulations to torpedo your big surprise. Not a great way to kick off any vacation, much less a marriage proposal. Try also to resist the urge of incorporating food into your proposal. A box of chocolates or a blow-out room service feast after the “yes” is fine, but leaving an expensive and elegant piece of jewelry under a pile of mashed potatoes isn’t a romantic surprise. It’s dumb. And you don’t want your lives as an engaged couple starting with a trip to the emergency room. Which, unfortunately, also happens. “A beautiful or meaningful venue is a great way to make the proposal special. A proposal over your Cheerios, less so. Go to the site of your first date, or a particularly meaningful place, like the park where you hiked together on the day you realized that you loved her. This shows that you’re taking care of her from the get go, and the most independent women will appreciate that message,” says April. It also showed that bigger isn’t always better. Others polled said they would have preferred a smaller, more intimate proposal. But the biggest faux pas of all those surveyed was proposing without a ring. Above all else, a proposal should be personal. She should know how much effort went into planning the occasion and it should be obvious that the person she loves crafted it specifically for her. There’s perhaps nothing that warms a woman’s heart more than cold, hard proof that her man listens to her, and a proposal is, in a way, the ultimate opportunity to show you’ve been listening. Has she told you about a tree in a park in her childhood hometown she always used to climb as a kid? Could be a great spot for a surprise question popping. Was your first date at a concert seeing her favorite band? A surprise pair of tickets and an evening out followed by a proposal during her favorite song might hit the perfect romantic note. If her friends or family are a big part of her life, consider involving them in the planning process or even the proposal itself. A woman already in the haze of disbelief following a marriage proposal would be positively beside herself if her best friend or parents were to “show up” shortly after the big moment, so if you know you can trust them with the secret, by all means include other people you know are important to her, especially since you’ll be sharing her with them forever. Remember though, the more people who join this conspiracy of love and the more layers of complexity that get added, the pressure and ante both jump, so don’t forget to consider every possibility, including stage fright. Why Do We Get Down on One Knee When We Propose? The short answer? Nobody knows. Which is crazy, considering almost everyone does it. It's been around since before the Victorian era, when there's art depicting the ritual. The act of “genuflection,” or to bow on one knee in worship or as a sign of respect, has been customary for millennia. 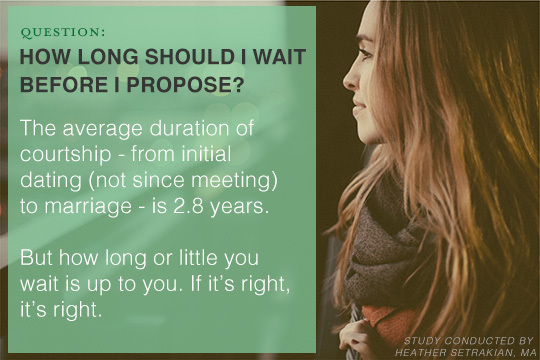 This also reiterates the importance of going into a proposal knowing in advance that she’s going to say yes. There may not be enough alcohol on the planet to numb the humiliation of being turned down in front of her parents or friends. “If you are going to go old school and propose in front of her family, try to make sure you’re going to get a yes — remember, a proposal is a question and there is more than just one answer she might give. 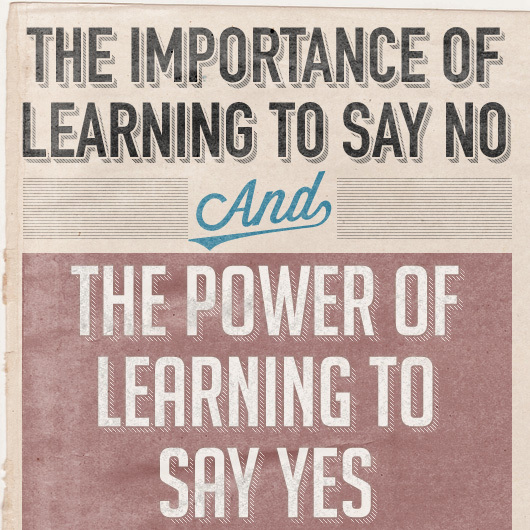 Can you weather the alternative to a “yes” in front of a crowd?” April said. Whether you believe it or not, the night you propose will be one of the most nerve wracking nights of your life. You will be jittery, you will be distracted, you will not seem like yourself to your partner. Bear down and ride it out, because the story of a well-planned wedding proposal is something they will be telling their friends and family about for weeks and will remember forever. It may be just one day or night of the rest of your lives, but the effort you put into your proposal will show her what she can expect from you for the rest of your lives. Good article! I really like some of the points you went over. I love statistics. If you know how to play the numbers, they can say whatever you want them to. Case in point, marriage/divorce rates. The Census Bureau and the CDC use the per 1,000 method with the CB showing what I assume to be averages across 4 different decades from 1980 to 2008 and the CDC showing 13 years from 2000 to 2012. The CB shows 13.5 marriages/6.6 divorces (averaged across the 4 decades) per 1,000 and the CDC shows 7.4 marriages/3.68 divorces (averaged across 13 years) per 1,000. Both of these represent a divorce rate of around 50%. One of the NYTimes articles doesn’t address how divorce rates are figured but throws out a number of percentages based on education, age and time when married. The other discusses how divorces rates are figured but only to say that the group of people polled for the article don’t like the “per 1,000” way so they figure divorce rates a different way and do not address how marriage rates are figured or if the two are equitable ways to figure the rates of each. If using the “per 1,000” way is fine for marriage rates, the same should be fine for divorce rates. I think this comes down to people not wanting to hear the negative and mass media not reporting the true negative for fear of alienating viewers/readers/listeners. Much the same way that unemployment rates are shown to be declining based on the number of people no longer receiving benefits without reporting what percentage of those people actually got jobs and what percentage of those people fell out of the unemployment system simply because they reached their time limit. Taken together the unemployment rate looks to be falling. Taken separately the unemployment rate probably stays the same and may actually be increasing. This guy did his homework. Maybe it’s just me, but shouldn’t a proposal happen when it’s right for the two people who love each other? Love doesn’t conform to standards or rules, and it often makes its own… while I am certain this helps alleviate some guys anxiety who are sweating the big question, I just think that one would propose knowing the other person well enough that they know the answer will and could be nothing other than “yes” . Lots of good tips here, but the author of this blog post can only cover so much. I wrote a book on the subject titled “How to propose without screwing it up”. I get emails every day from men who say it helped answer all the unknown and easy anxiety around popping the question, and sisters, mothers, and friends who say it’s the perfect gift for the men in their lives that need a little help. You can find it on amazon! very extensive and interesting article! laid out everything as on the shelves. but how to make a wedding proposal is a mass!